Updated: 101-2540 (picture and/or text). Updated: 101-028, 101-530, 101-1332, 101-1520, 101-1598, 101-1774 (picture and/or text). Updated: 101-002, 101-124, 101-166, 101-268, 101-368, 101-848, 101-878, 101-902, 101-982, 101-1048, 101-1080, 101-1292, 101-1486, 101-1700, 101-1858, 101-1900, 101-2092, 101-2192, 101-2706, Unknown 117, Unknown 198 (=101-2092), Unknown 199 (=101-1292) (picture and/or text). 2017-10-25 'Unknown 213' was incorrectly registered as 101-2670. For sure 'Unknown 2' is 101-2670! Updated: 101-878, 101-924 (picture and/or text). 2017-09-04 101-2514 was incorrectly registered as 101-2614. Added: 101-2614 (the real one). Updated: 101-552, 101-638, 101-1380, 101-1438, 101-1904, 101-2512, 101-2612 (picture and/or text). Updated: Unknown 72 (might be 101-1716), 101-126, 101-178, 101-642, 101-686, 101-870, 101-924, 101-1120, 101-1782, 101-1904, 101-2358, 101-2716 (picture and/or text). Updated: 101-1896, 101-2016 (picture and/or text). 2017-08-23 Added: 101-104 (engine only), 101-878 (engine only), 101-1140, 101-1178, 101-2360 and 101-2714. Updated: 101-802 (for sale), 101-1932 (is matching #) and 101-2646 (picture and/or text). Updated: 101-524, 101-572, 101-650, 101-1932, 101-2786 (picture and/or text). 2017-07-07 Added: 101-1088 (engine only!). Updated: 101-866 (picture and/or text). 2017-06-26 Added: 101-1458 (gearbox tunnel only!) and 101-1808 (engine only). Updated: 101-100 and 101-852 (picture and/or text). 2017-02-04 Updated: 101-1382 (picture and/or text). 2017-02-01 Updated: 101-398, 101-1354, 101-1552 and 101-2640 (picture and/or text). 2017-01-20 Updated: 101-554, 101-642, 101-1038, 101-1086, 101-1580, 101-1618, 101-1742, 101-2078 and 101-2290 (picture and/or text). I resized all pictures to a width of 800. I corrected a fault that displayed pictures of the Unknowns double. 2016-12-19 Updated: 101-970, 101-2444 (picture and/or text). 2016-12-15 Updated: 101-1806, 101-1382 (picture and/or text). 2016-11-30 Updated: 101-1038, 101-1336, 101-1804 and 101-2310 (picture and/or text). Updated: 101-642, 101-886 and 101-1232 (picture and/or text). 2016-11-13 Added: 101-770. Offered for sale in Palermo, Italy, but owner unknown. Who knows the owner? Updated: 101-552 STOLEN IN 1997 IN MELBOURNE!, 101-848, 101-992 and 101-2806 (Touring number wanted) (picture and/or text). 2016-11-11 Updated: 101-1496 (Frua coupé) (picture and/or text). 2016-11-10 Added: 101-1932 (engine only). Updated: 101-1666, 101-1774 and 101-2024(picture and/or text). 2016-11-08 Updated: 101-306, 101-1710, 101-2116, 101-2384, 101-2578 and 101-2660 (picture and/or text). 2016-11-07 Updated: 101-1616 (picture and/or text). 2016-11-02 Updated: 101-930, 101-1120, 101-1862 and 101-2638 (picture and/or text). Updated: 101-404, 101-572, 101-1652, 101-1764 and 101-1860 (picture and/or text). 2016-10-31 Updated: 101-982 (Engine only), 101-1486 (Engine for sale) and 101-2796 (picture and/or text). 2016-10-29 Added: 101-572, 101-970, 101-1782, 101-1788, 101-1830, 101-1874, 101-2780 and 101-2820. Updated: 101-404, 101-1354, 101-1764, 101-2324, 101-2522, 101-2638 and 101-2828 (picture and/or text). 2016-10-24 Updated: 101-604 (picture and/or text). 2016-10-12 Updated: 101-554, 101-1606, 101-1860, 101-2010 (picture and/or text). 2016-10-05 Added: 101-1804 and 101-2310. Updated: 101-834, 101-850, 101-1518, 101-1604, 101-2058 (picture and/or text). 2016-09-29 Updated: 101-108, 101-426, 101-648, 101-1552 and 101-1902 (picture and/or text). 2016-09-26 101-542 was incorrectly registered as 101-1770. 101-1770 is an engine only now! 2016-09-24 Updated: 101-2290 (picture and/or text). 2016-09-22 Added: 101-152 and 101-954 (RHD). Updated: 101-1580, 101-2102 (ex-Eddie Fisher, Elizabeth Taylor and Anthony Quinn) and 101-2408 (picture and/or text). 2016-09-20 Updated: 101-124 (picture and text). 2016-09-19 Added: 101-108, 101-642 and 101-972 (engine only). Updated: 101-136, 101-186, 101-398, 101-430, 101-630, 101-738, 101-1184, 101-1230, 101-1488 and 101-1718 (picture and/or text). Updated: 101-005, 101-350, 101-1470, 101-1502 (prototype), 101-1550, 101-2576 and 101-2696 (picture and/or text). 2016-09-09 Updated: 101-088, 101-306, 101-326, 101-424, 101-630, 101-1710, 101-2116, 101-2384, 101-2578 (picture and/or text). 2016-09-08 Updated: 101-648, 101-442 (ex Marcel Zwaneveld), 101-2802, 101-1132, 101-2716 (picture and/or text). 2016-08-21 101-2658 was incorrectly registered as 101-2856. For 101-2658 the owner was unknown, but country was South Africa (added in 2007). This seems unlikely now, as the car was bought by its owner Barry Fagan in Phoenix Arizona USA in the summer of 1974 and he owned it ever since. Please note: Now the last car with a picture is 101-2854. Added: 101-934 and 101-1018-LHD (as 101-1019, this VIN is used double by Maserati for a RHD which was already in de registry), thanks to Terry Bigioni and Louk Winkelhagen. Updated: 101-1988, 101-1802, 101-1806 and 101-2590 (picture and/or text). 2015-08-17 101-1730 is unknown 58. Thanks to Emily of classicsmuseum in Hamilton NZ . 2014-12-10 picture of 101-126 added. 2014-12-07 picture of 101-2792 added. 2014-10-13 New info on: 101-552 101-856 101-990 101-1092 101-1118 101-1446 101-1798 101-1810 Thanks to Marc Florie! 2014-09-20 New info on 101-1354, also picture added. Unknown 108 is not 101-2140 . 2014-04-19 Extra info on 101-1824, 101-804 and 101-832(new in registry). 2014-04-16 Picture of 101-1824 added. 2014-04-06 101-314 added. The car is in France and needs total restoration. No photo's yet. 2014-03-16 New car added: 101-2802 and picture of engine 101-2280. 2014-01-09 Three very interesting chassis numbers added: 101-010, 101-456 and 101-502 . 2014-01-08 Unknown 209 is 101-1168. Thanks to John Cohen and Rodger van Steekelenburg. 2014-01-05 Added a picture and extra info of 101-1168. Changed the picture of 101-412. 2013-12-27 Added a picture and extra info of 101-2786. 2013-12-05 Added pictures of 101-2684, 101-1668 & 101-2192. Thanks to Fabio Collina of Maserati Classiche. Engine 101-630 is reunited with the car!! Thanks for the info Roland Levebvre. Thanks to Andrea Montalenti for providing these docs. Thanks to Andrea Montalenti for resolving the unknowns. 2013-08-30 Site handed over from Ruud Bax to Marcel Zwaneveld. Thank you Ruud, you have done an excellent job for this site!! 2013-04-13 Added 101-904,101-1208, 101-1416, 101-1770, 101-1774 and 101-2400. 2013-03-09 Added 101-1094, 101-1372, 101-1702, 101-1744, 101-2016 and 101-2026. Also added 101-192, 101-912, 101-2140, 101-2764 and unknown 205. 3 unknown cars solved by Corrado Bellabarba. 101-398 (unknown 15), 101-1408 (unknown 13) and 101-2048 (unknown 180). 101-2024 send by Emiel Hendriks and additional pictures by the the owner. 101-2432, send many of the regular visitors. Also added 101-1332, 101-1446, 101-1798. 2012-09-19 Added 101-1122 and 1128. Also unknown 197, 198 and 199. 2012-08-14 Added 101-782, 101-1022, 101-1360, 101-1700 and 101-1908. 2452, 2502, 2508, 2554, 2594, 2596, 2602, 2678, 2702, and 2830. 101-160 from Ermanno Keller added. 101-1448, 101-1454, 101-1604, 101-1616, 101-1696, 101-1816, 101-1824 and 101-1840. 101-1076, 101-1080, 101-1116, 101-1330, 101-1560, 101-1588, 101-1820 and 101-1900. The other cars will be added soon. 2011-11-22 Added engine 101-806 and cars 101-860, 101-1330, 101-2628 and 101-2838. 2011-08-28 Added the real 101-2856, unknown's 189, 190 and 191. 2011-06-11 Added 101-258, 101-1612, 101-1646, 101-2444, unknown 181, 182, 183, 184 and engine 101-136. 2011-04-06 Added 101-2262 and engines 101-424, 101-1118 and 101-1650. Engines 101-048 and 101-352 added. Cars 101-708, 1652, 2192, 2322 and 2408 added. 2010-12-29 101-070, 101-772, 101-798 parts and engine, 101-800 engine only, 101-1654 and 101-2768 added. 2010-10-07 101-1410, 101-1814 and 101-2332 added to the register. Update on 101-1136. 2010-04-19 Larry Ruben has send 80's pictures of 101-716 and 101-1296 which he used to own. 2010-03-07 101-2246 added to the list. It's for sale in the UK. 2010-02-21 Update on 101-1006, 101-1292, 101-1842 and 101-2010, the Autosport testcar. 2010-01-31 Added pictures from 2005 engine rebuild of 101-1044 in the Workshop section. Added pictures of 101-1470 gearbox rebuild. News from on 101-1844 and 101-2674 from owner Antonio Salzano. 2010-01-25 New is 101-1432. News on 101-1006 and 101-2042 and 101-2234. 2010-01-24 Very early car, 101-022 shows up for sale. News on 101-1842. 2009-12-25 New unknown cars added to the list. 2009-12-24 Various new unknown cars offered for sale. Layout has been changed. 2009-12-05 Finally the database is now running in MySQL, which keeps it more easy to mantain. Corrado Bellabarba gave me info on Unknown 18, 89 and 157 who are infact 101-264, 101-1030 and 101-2366. 2009-11-14 New 101-301?, 101-416 (engine), 101-446, 101-628, 101-1012, 101-1374, 101-1842, 101-2366, unknown 152, 153, 154, 155, 156, 157, 158, 159, 160, 161, 162 and 163. 2009-04-19 101-834 and 101-586 added. Unknown 12 is 101-2392. For sale section updated. 2009-04-13 Some new unknown's added. For sale section updated. 2009-03-29 Some new unknown's added. 2009-03-25 Unknown 139, 140 and 101-2234 added. Parts section update from Larry. 2009-03-22 101-1712, 101-2036 and 101-2244 added to the list. In the database, all cars are back in order of chassis number. 2009-02-22 101-040 and 101-2696 added to the list. 2008-11-30 New on the list is 101-840. 2008-10-26 101-2250 and 101-2756 added, update for sale section. 2008-10-05 Some new unknown cars added, update for sale section. 2008-09-28 Some cars showed up for sale: 101-512, 101-1042, 101-1376 and 101-1860. An early car, 101-166 was dicovered by Jerome Despierre in Venuzuela. Other new cars 101-1860 and 101-1486. 2008-08-12 Some new unknown cars added and the for sale setion updated. 2008-08-03 The cars are moved from an spreadsheet to a database, so it took some time to update the site because things had to be converted and i had to find out how to get the car section from the database. The Cars section layout with index will be back in the future. Added 101-850, 101-874, 101-1058, 101-1990, 101-2096, 101-2484 and 101-2758. 2008-07-15 Added 101-1116, 101-1350, 101-1480, 101-1936, 101-2022 and 101-2646. Unknown 20 and 66 are actual 101-2520. 2008-04-06 101-454, 101-942 and 101-1508 added to the list. Pictures added from 101-566 and 1010-2010. Update for sale section. 2008-03-24 Some new cars for sale in holland. 2008-03-18 101-2116 and 101-1578 added to the list. Update in Workshop section and database with 3500's changed. 2008-01-27 Marek Blaha informed me that 3500 GT Unknown 99 is 101-2114. New Unknowns added. 2008-01-20 New on the register is 101-1844 from Michele Migliaccio Some new cars for sale and some new unknown cars. 2008-01-02 Rainer Christ informed me that Unknown 85 is his 101-2826. Olaf Boecking dug up old magazines during christmas and send me info on 101-122, 930, 1292, 1358 and 1536. Also various news on other cars was included. Unknown's 101, 102 and 104 added. More to come. 2007-12-09 101-448 and 101-2458 showed up in Holland News from Gerard van Steekelenburg on his 101-1168. 2007-12-02 101-142 showed up in Mexico, it needs restoration. It has all the features an early 3500 must have. 'The versions' section is under reconstruction. 2007-11-24 New on the list is 101-2798 from Steve Mahac. A '3500 Wanted' section is added. Some new unknown cars added. For sale section updated. Now 239 GT's, 132 GTI's and 100 unknowns on the list. 2007-11-11 Douglas Howell send me info on 101-1328, 101-2706 wich was unknown and a new unknown, 97. 101-706 and 101-1022 are for sale at eBay France, source Marcel Zwaneveld. Antti Wihanto who owns 101-2406 gave me info on 101-616. 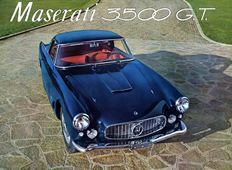 Peter Grootswagers gave me the article in Retroviseur with the 3500 GT and Jaguar XK150 DHC. 2007-11-01 101-2526 for sale at eBay. Anthony Hall owns 101-2148 wich was once owned by Victor Muller from Spyker. This was Unknown 11 on the list. 2007-10-30 Unknown 75 is 101-1710 and owned by Jean-Christophe Brial. Also 101-1522 is new to the Register and is from Melchor Daumal Castellon. 2007-10-27 The fate of 'Unknown 64' is solved. It's 101-2572 and owned by Willem Oosthoek. Willem has send me the story of the car. Also news on 101-1550 from Harry Garschagen. Theo Biekens has send information of 101-1622. 2007-10-13 New information on 101-052 from owner Claus Merk and some unknows added. 2007-10-09 Donato Maniscalco now owns 101-2626. Olaf Boecking dug up his archives wich resulted in 20 new cars so far. 2 new color combinations added, came form Andrea Montalenti. He has send me more info wich i have to sort out since many news is send to me last week. 101-1132, a RHD 3500 GT is for sale in Holland see the for sale section. 2007-10-03 New to the list is 101-1266 from Gianluca Baldisserri Moret Georges informed me about the existance of 101-1542. Olaf Boecking told me that unknown 3500 50 is 101-2584. 2007-09-30 15 unknown cars added, some known cars have a picture now. 2007-09-29 Major update. "The Cars" is split up into 3 new sections, 3500 GT's, 3500 GTI's and an Unknow 3500's section with new 54 cars. The "links" section is also updated. 2007-09-11 Paolo, the owner of the 3500 wich is for sale on eBay.it kindly gave me the chassisnumber of his car. It's 101-1230. See the "For Sale" section. 2007-09-09 News from Laurent Taurel who owns 101-1924. Mark Potter spotted 101-2654 and update For Sale section. 2007-08-13 101-2524 spotted on the Nurburgring. 2007-08-05 Olaf Boecking send in 3 new cars, 101-184, 101-190 and 101-2856. The latest is the new highest car in the database. Got info from David Cox who owned 101-2612. Got in contact with Ian Fitz-Simon who sells 101-2766. 2007-07-18 Daniel Mataré has send me news on 101-2834 wich is for sale in Switzerland. 2007-07-15 101-2384 at auction at H&H at 25 july 2007. Got in contact with Thomas Sassenbach who owns 101-516.